It’s halftime, so perhaps it’s a good idea to focus on a classic today. It feels odd writing about Tarkovsky, because he has never been named as a slow-film director, until the term Slow Cinema came up. I was really happy when I could finally get the Tarkovsky box set. The reason I’ve chosen The Sacrifice for today is that I remember the film for its slowness. No other Tarkovsky film felt this slow, and, I have to admit (shame on me!) that I didn’t finish the film the first time round. I almost fell asleep. This must have been two or three years now, so it was time for a retry. The Sacrifice was Tarkovsky’s last film. If you haven’t watched any of his films, it might appear less obvious. But The Sacrifice is his bleakest and darkest film. His films were never cheerful. Yet, this one is the culmination of bleakness. There is repeated talk of hopelessness, the downfall of humanity, loss of perspective, death. And then there is this imminent nuclear disaster. Béla Tarr has ended his filmmaking career in a similar way. The Turin Horse was the culmination of his bleak view on the world. You could see that there was nothing else to say. I had the same feeling about The Sacrifice. I found two features striking. Neither of them has a lot to do with slowness, though. The first one is the general set-up indoors. Alexander, the main protagonist, who vows to sacrifice all that is dear to him so as to prevent the nuclear catastrophe that had been announced on TV, is a retired theatre actor. I’m not sure whether Tarkovsky intended to transmit this via his filmmaking, but the shot length, the camera angle, and the movement of characters certainly imply that there could equally be a theatre play going on rather than the production of a film. The camera is a good distance away from the actors. They tend to speak towards the camera as if to a (theatre) audience. The whole – fairly scarce – mise-en-scène (the interior of the house especially) brings up images of a theatre stage with a painted background and a few props positioned on stage. I haven’t had a similar feeling in his other films. The Sacrifice, however, never had much of a film-feeling to me. I guess the long-take help with this. And somehow, I can’t help it, the colours help, too. The second thing is perhaps a bit obscure. Although I used to love the concept, and actually still do, especially when I’m watching a film by Tarkovsky, I have put it aside, because I brought up two people against me, and I wasn’t fond of that. The Sacrifice is, in parts, a great demonstration of what Daniel Frampton called “the filmind”. The basic idea is that film has a mind on its own. Film is thinking. As radical as it sounds, when I read his book, his proposal blew me away. I cannot detect a “thinking” film all the time. 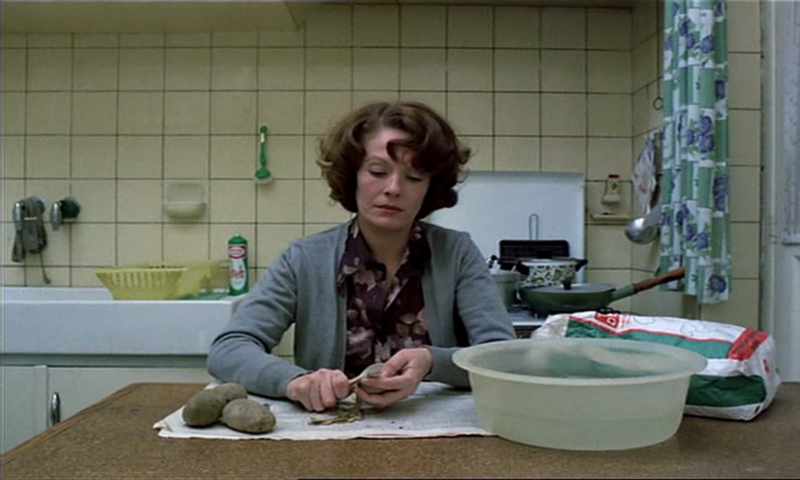 But Tarkovsky’s films are exemplary to Frampton’s approach. The beginning of The Sacrifice can be taken as a very simply illustration. When Alexander sits with his back against a tree and continues with his monologue, the camera moves away from him. It feels as if the camera, or the film, decides to look for something visually more interesting or important. It is really only the camera moving, but I always got the sense of the film doing something, and not only the director. There is an eerie presence of a third agent in (all of) his films. I’ve only ever had this eerie feeling with Tarkovsky’s films. The feature of the thinking filmind is spread throughout the film, as it is in Mirror, where, I believe, it is most evident (I have actually written quite a bit on this a while ago). The independence of the camera (or the film) can also be found in Tarr’s films. The film makes decisions independent from what the characters say or do. Perhaps it sounds like an abstract concept, but you should give the book Filmosophy a try.